Product: Miro Model 2.5-Conduit Support-7 Gang Conduit Pipe Support System, 12" Wide Unistrut, Adjusts in Height from 2.8 to 7", 7-1/2 x 10" Polycarbonate Base. Price/Each. 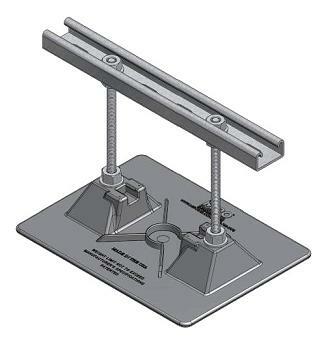 DESCRIPTION: A roof top pipe support system with a 12" wide Unistrut®. System is commonly used to support roof mounted electrical conduit, solar piping, gas pipes, and other mechanical piping. The unique design absorbs thermal expansion and contraction of pipes thus preventing damage to the roof membrane or piping system. Designed for severe outdoor exposure and long life, the pipes rest on a heavy duty 14 gauge P4100 Unistrut system which is made of hot-dip galvanized steel. The pipe support base is made of polycarbonate resin. The adjustment rod is 3/8" stainless steel. Other metal parts are made of hot-dip galvanized or stainless steel. Pipe stand will accommodate up to 2.5" pipe (inside diameter) or up to 3" (outside diameter) pipes. Base Material: Polycarbonate 7-1/2" by 10.90"
Hardware: 3/8" stainless steel rod. Related hardware is stainless or hot dip galvanized. Max Pipe Size: 2.5" inside diameter and 3" outside diameter. Max Pipe Clearance: 2.5 Conduit Support has a maximum pipe clearance of 7". Max Load Weight: Maximum load weight may not exceed 115 lbs. per pipe stand. Spacing: Manufacturer's recommended spacing is not to exceed 10 foot centers depending upon the load. Miro 9 inch Wide x 15-1/4 inch Long Rubber Support Pad. Provides a 1/8 inch protective barrier between roof membrane and rooftop equipment. Features 100% recycled rubber and raised lip for slip resistance. Price/Each. OMG Height Adjustable Height Strut Pipe Support, 10 inches wide, 4-10 inch height adjustment. Black EPDM Base. Supports pipe sizes 1/2 to 6 inch nominal. 800 lb. Load Capacity. 5/Box. Price/Box. Roofing Walkway Pad. 30x30 inch Black EPDM, Round Dot Pattern. Pad has 0.100 base thickness with 0.025 inch raised round pattern (about .125 overall). EASILY CUT TO SIZE. Price/each.